Ita bags are a popular way for fans, especially in Japan, to show their love for an anime/character/ship. These bags have a clear protective pouch for displaying charms, badges, etc, so you don't have to worry about them falling off. My philosophy is generally, "Can I add LEDs to it? Yes? Okay, let's do it!" So of course I needed to add LEDs to an itabag for my growing collection of merch. In this Instructable, I'll show you how I made a glowing ita bag to display my Yuri on Ice charms. This tutorial assumes you have a basic understanding of how to work with WS2812B/Neopixel LEDs, Arduino, soldering, laser cutting, and sewing. and of course, LOTS of acrylic charms! In order to get a vector to laser cut in the exact shape of the heart on my ita bag, I scanned the bag. Yes, this was pretty ridiculous, but it worked. I placed a piece of cardboard inside to ensure good contrast for the heart. I also pressed down on the front of the bag while scanning to get the best result. I am using the Aliexpress bag linked previously, so if you're using that bag, you may be able to re-use my vector file. See the next step to download the files. Open your scan in GIMP or similar editing program. Use the thresholding tool to get the heart black and the bag white. Then manually clean up the image with a paint tool to get rid of the stray white pixels from the glitter and the dark pixels from the stitching. Crop the image so you're left with a black heart on a white background. Open up Inkscape and import your cropped heart image. Right click and select Trace Bitmap. It should work with the default options since everything's already black and white. Hit ok! This will create a vectorized image on top of the original bitmap, so move the vector off and delete the bitmap. Now adjust the fill and stroke settings. Change the fill to none, the stroke paint to black, and the stroke thickness to whatever is required to do a vector cut. In my case, that's 0.001 inches, but I made it thicker for the screenshot so you can see the lines. You can also rotate the heart if it's not quite at the right angle. Double click until the rounded handles appear around the vector, and drag to rotate until it's aligned properly. I used a 75W Epilog laser cutter to cut my heart out. If you're not familiar with how to laser cut, please look up another tutorial on that. I've attached the vector cut settings as well as the vector file I used in a few different formats. Once your heart is cut out, remove the protective paper backing. If you do not have access to a laser cutter, you can print out the pattern and trace onto cardboard, foam board, wood, etc, which you can cut by some other means. 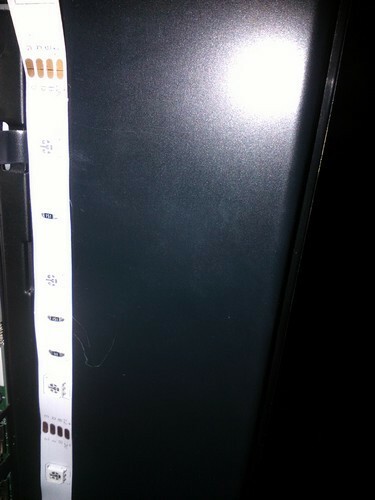 Before you do anything, test your LED strip! I used an Arduino Uno at first because I wasn't sure how long I wanted my wires to be. If you want, you can skip straight to using the Circuit Playground -- see the next step for details on how to hook that up. Set up an Arduino with strandtest and wire it to your LEDs. The schematic is attached. You can use solid core wire or male/male jumpers and poke that into the holes in the connector - no soldering required for testing. Once you're sure all the LEDs are working, proceed. Arrange your LEDs on your acrylic heart and tape them down temporarily with kapton tape or masking tape. You'll have to cut apart the LED strip to get a heart shape, so be prepared to do a LOT of soldering. Also make sure that you keep the direction of data flow correct. Once you've got your LEDs arranged, tin all the copper pads at the end of each LED segment. Be careful not to melt your acrylic with your soldering iron. For connections that are very close together, you can use male headers as connectors rather than trying to cut and strip tiny wires. Use needle nose pliers to pull the header pin out of the black plastic harness. Clip it to a shorter length if needed. Use one hand to hold the pin in place over the pads with the needle nose pliers and the other to hold the soldering iron. Press down onto the end of the pin with your iron until the solder flows onto the pin. Do this for the other end as well. Then add some more solder to each side to make sure you've got a good connection. Reflow the solder again while holding the pin down with the pliers to make sure everything's flat and you've got a good joint. For longer connections, just use wire as normal. Strip and tin each end, and then solder to the tinned pads. I recommend hooking up the strandtest Arduino periodically to test your soldering as you go. After you're done, I recommend adding some hot glue for strain relief to protect the connections. Follow Adafruit's tutorial on setting up Circuit Playground for the Arduino IDE. 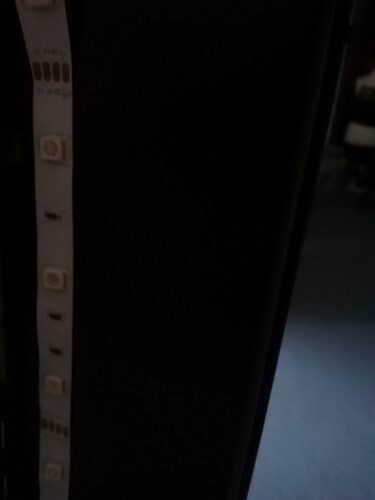 Install the FastLED library. In the Arduino IDE, go to Sketch > Include Library > Manage Libraries. Search for FastLED and install. In your Arduino directory, create a folder called ItaBagHeart and copy the attached code file into it. Open it in the Arduino IDE and upload to Circuit Playground. If you set up the LEDs exactly as I did, you don't have to change anything. But if you have a different number of LEDs, you'll need to edit NUM_LEDS and NUM_OUTER (the number of LEDs in the outer heart). Feel free to edit the colors or animations in any way you like. I'd like to give some credit to the following for giving me a great starting point for the animations: Erin St Blaine's circuit playground sparkle skirt and Tweaking4All's FastLED animations. Now let's make the final connections! Make an extension cord. Cut 3 long wires of equal length for power, data, and ground. Make sure it's long enough for the wire to reach from the bottom of the ita bag front pouch and into the main backpack. Strip and tin the ends of the wire. Also get the spare connector that came with the LEDs and strip and tin those wire ends. Solder the wires together, making sure you stay consistent in your power, data, and ground wires. Also add a 470- ohm resistor to the data wire. (It's not 100% necessary but it's best practice.) Put heat shrink over the soldered connections and shrink. You can also place heat shrink around all 3 wires periodically to keep them neatly held together. Solder the other end to the circuit playground - ground to ground, VBAT for power, and #6 for data. Lastly, put some hot glue over the connections to add strain relief. Now you can plug in your battery and see if everything works! Use the left button to cycle through the animations. LED effects look best when diffused, so we're going to make a small pillow to place over them. Load up the vector file with the heart design again and change the paper size to Letter. Rotate the heart so it fits on the page and print out a few copies. Cut out the heart. This will be your pattern for cutting out fabric and batting. I noticed that the design is very slightly asymmetrical, so line the pattern up with the acrylic and note which side of the pattern is the front and which is the back to keep everything aligned. Pin the pattern on to the quilt batting and cut out two hearts. Pin the pattern on the muslin/white fabric, but do NOT cut directly around the pattern. Do a rough cut out of the muslin with at least 1" around the heart. Trace the heart pattern onto the fabric with a pencil. Now, cut around and leave approximately 1/4" seam allowance. Make 2 of these. Carefully align all your layers - one muslin, two batting, one muslin, and pin together. Sew with a straight stitch directly onto that pencil line you traced earlier all the way around the heart. When you're finished that, go around the outside edge with a zigzag stitch to protect against fraying. I am not good enough at sewing to figure out how to get all the seams inside in this case since it's a weird shape, but feel free to do that if you know how. Next we're going to make the heart that we'll pin the charms to. Place your pattern underneath the fabric and carefully arrange it with respect to the fabric pattern. In my case, I have text, so I wanted to make sure the text was straight across the heart. Pin the pattern to the fabric and cut out around it with about 1.25" extra around the heart. Trace around the heart pattern on the back side of the fabric with pencil. Break out your iron. Press back a hem of 1/4" and pin in place. Make relief cuts as necessary when going around rounded edges. Sew your hem down. Cut out a heart shape from the interfacing. The shiny side will attach to the back side of the fabric, so make sure you pin your pattern on in the correct direction. Put the shiny side to the back of the fabric and line it up with the pencil outline. Grab a press cloth (I just used a scrap of muslin) and dampen it. Place the cloth over the interfacing and iron until it sticks. This will help strengthen the fabric for pinning charms to it. Now we need to attach the cloth to the acrylic using velcro. First attach the pillow to the front of the acrylic. I used two dots up top. Try to line up the pencil-traced/sewn edge of the heart with the edges of the acrylic. Next we need to wrap the decorative fabric around and make velcro connectors for that, too. I didn't completely wrap it tightly around every curve, but that's ok. The excess won't really show on the bag. Using this technique, you can easily swap out ita bag sets. Make one cover for each character and swap out whenever you like! Take your charm base fabric off of the acrylic. Arrange your charms on the heart however you like. Disconnect any extra straps so they don't get in the way. You can use your needle nose pliers to open up jump rings to get rid of keychains. Use safety pins to attach the charms. Poke the pin through from the back, place through a jump ring, poke it back through, and close the safety pin. Once you're done, re-attach it to the acrylic heart with velcro. Step 10: Ita Bag Complete!! Connect all the electronics. Insert the heart into the front pouch of the bag. In order to do this, flip over the top of the backpack towards the front so you can slide it in more easily. One last step - use a couple of velcro dots to attach the back of the heart to the backing of the pouch. Now you're ready to show off your love to the world! I'd love to see your ita bags. If you use my tutorial, please let me know! All files can also be found on my GitHub. work. I want to do something similar but have no idea about programming. all there is only one effect I wanna have. 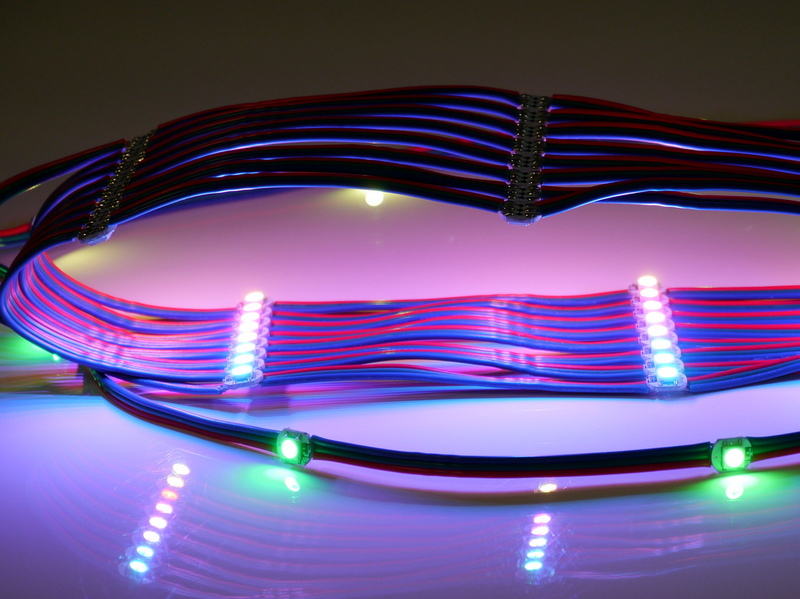 although I would use already connected neopixels I found on a webside. 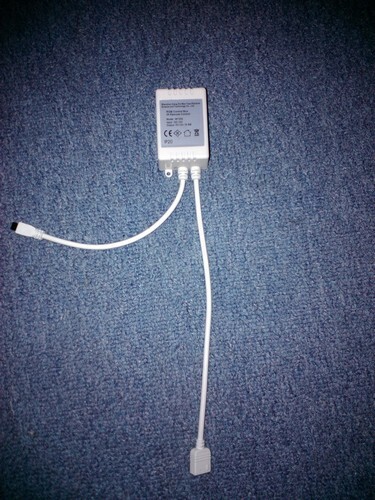 then would only have to ad a battery and a connection to the battery. put it around in the edges. 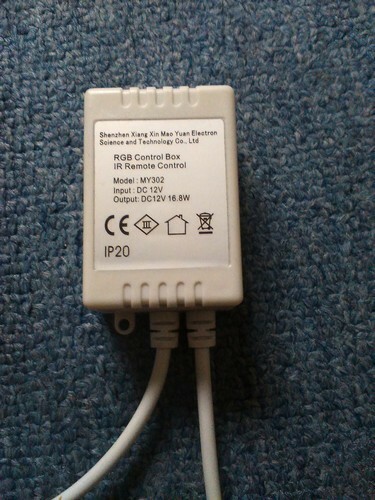 It's also connected to a 12 V power supply. around me. That's why I'm now asking you. Hi there! I'll try to help you as best as I can. You don't need a laser cutter. You can cut the heart shape out of cardboard with a knife if you'd like to use that shape. You can do heatshrink either with a lighter or with the upper part of your soldering iron (not the tip). You can also get a cheap heat gun for about $10-$15. I don't know that much about MakeCode so I can't help you programming that. However, one of the effects I include in my code is basically that pulsing light in a single color, so you'd only have to edit the color used by that effect. I do not recommend 12V LEDs for this project if you want to use it with a microcontroller. You need a MOSFET for each color channel. It's a much more advanced circuit. 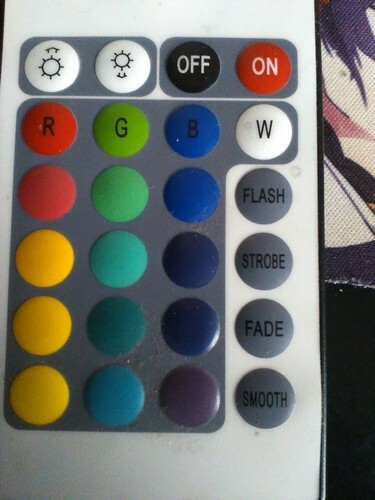 See here: https://learn.adafruit.com/rgb-led-strips/usage Additionally, my code would not work with those LEDs. 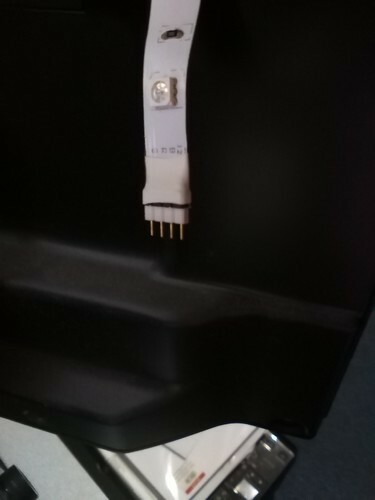 to ad a plug so that I can connect it with the chip. So I thought using this as the start and 3 pixels of the WS2811 and then go on with the GS8208 because they have the same voltage. So the option 2 would be... 12 V battery case > Control Panel Case > 1 part of WS2811 (which contain 3 LED lights)+plug to control panel case > go on with GS8208 around the heart and my remote control to switch it on or off. Thanks in advance and thank you for your help you already gave me. I really don't recommend using the 12V strips for portable use. they're more intended for use in cars where you have a stable 12V supply. You don't wanna be carrying around a 12V battery. Also you'd need to level shift the signal from the microcontroller to 12V. If you only want an outer heart, my code will still work. There is an option to change the total number of LEDs and the number of LEDs in the outer/inner heart. I want to order my products soon but I have a question avout the programm you used programming the Adafruit Playground and the neopixels. You wrote you used FastLED Library and posted a link but... I get redirected to a side where you download a .zip and a tar.gz file and I don't know how to open the second file. Can you say me more? There was also the question left if you may help me if I have problems understanding the code after reading the instructions on the github side. Installing libraries is a basic Arduino skill. Please click the link to Erin St Blaine's tutorial as it includes instructions. Again, this is the sort of thing you need to search out for yourself as it's not specifically related to my project. Okay, I consider not to take the 12V ones. But I don't need the first link because I already found a shop in my country that sells these already connected neopixels WS2812B and you can select yourself how much neopixels you want to have in the LED strip (I thought about 27). It's the ItaBagHeart.ino file, right? Which programm do I need? And can I ask you directly if I don't understand how to change the code or have problems changing the code? Would the code only work with the Adafruit circuit playground or also with the Adafruit Corcuit Playground Express? Thank you so much till now that you help me a lot. Thanks for the tutorial, this is awesome! I have a question though, is there a more cuttable alternative to acrylic for the heart that you would recommend? I have resin readily available but was thinking there might be a plastic that's a bit easier to cut than acrylic. I do not have access to a laser cutter. Thanks! Well, it doesn't have to be plastic. If you had sturdy cardboard or foamboard that would work too. You can trace the pattern and cut with a knife. Can you use a different Arduino board (i.e. trinket) instead of the UNO? Mainly concerned about space/formfactor etc. :) I'm pretty new to arduino myself! Thank you! I only used the Uno for the purpose of testing the LEDs while soldering. The final installation uses a Circuit Playground. A Trinket would not have enough memory for the code I wrote. Thank you! I love Circuit Playground too. It's so convenient having buttons, LED indicators, sensors, etc, all together in one board!